The Watchtower Society teaches that since Jehovah’s Witnesses alone have God’s backing and are the only ones that worship the true God, shortly they alone will survive Armageddon. The Watchtower goes as far as to state that there are billions in line for destruction. The billions slaughtered at Armageddon loose any hope of a resurrection; theirs is said to be an everlasting destruction. Rarely does the Watchtower make such audacious statements; rather the destruction of non-witnesses is conveyed (with unwavering regularity) by means of a number of more subtle concepts. The quotes that follow identify the preposterous claim that following the Bible is not enough for salvation – neither are belief in Jesus Ransom and a moral life. Only submission to Jehovah’s Watchtower Organization results in life. Note that some individual Witnesses internally do not believe salvation is the exclusive domain of Jehovah’s Witnesses. Others salve their conscience and sense of justice by saying that many will flock to God’s Organization just before the end. The following quotes will show that the Watchtower does not support such ideas but plainly teaches only its followers will be saved. Association with Jehovah’s organization – the Watchtower Society – is presented as essential for salvation. To be considered part of that Organization requires reporting as an active publisher for the Watchtower Society. It is considered that children share in the sins of their parents, so babies will die at Armageddon if their parents are considered unworthy of salvation. A similar claim is that salvation comes from association with the “little flock”, also said to represent “the remnant of the 144,000” or “the Anointed”. Anyone that is part of any another religion, referred to as Babylon the Great, will not survive but “share in her plagues”. The narrow door excludes Christendom as well as the other major religious tenants. Noah’s salvation in the ark represents baptism as part of Jehovah’s organization. Using the word Jehovah is essential for salvation. This may appear logical when reading New World Translation Scriptural citations, but on becoming aware that the word Jehovah never appeared in the New Testament and has been falsely added into the New World Translation this reasoning can be seen to be false. Armageddon is described as a horrifying event. Billions of carcasses will be strewn across the ground, left by God for the beasts and birds to gorge upon. Would a loving God be planning to devote billions of people to a violent and everlasting death? A God that is willing to slaughter 6 billion people is certainly not the God Russell described when starting the Bible Students. Russell left the Presbyterians because he could not believe in the injustice of a God willing to destroy the majority of humankind. Similarly, Russell could neither accept the salvation of only Adventists. Under Russell, the Watchtower used to teach that irrespective of religion, most people would survive Armageddon. His understanding on ‘future probation’ was that the masses of humanity would survive Armageddon and be educated on earth by Christ in the 1000-year reign, before receiving judgment. The resurrection was for all who have died, Adam included. Yet the religion he founded now claims even more than “ninety nine of a hundred will be destroyed.” Globally there is only one Witness for every 1,000 people on earth. Therefore, on current statistics the Watchtower teaching is not that 99 out of 100 will be ruined, but rather Jehovah will eternally destroy 99.9 out of 100. It was during the leadership of Rutherford that the teachings of ‘irrevocable ruin’ and ‘judgement periods’ were introduced, concepts Russell tried to avoid. In the Watchtower 1923 pp.310-311, it was shown that clergy would not be saved. In 1930, pp.275-281 Rutherford introduced that people who disagreed with him, apostates, would be in line for everlasting destruction. The Watchtower 1939 p.170 claimed those from prior judgement periods, such as Sodom and Gomorrah would not be in line for a resurrection; neither would Adam and Eve, Solomon or the Scribes and Pharisees. Later leaders have not attempted to soften the hard-line stance of Rutherford. In 1986, any Witness that disagrees aloud that God will destroy millions, (or more accurately billions) was classed an opposer. The Watchtower feels necessary to clarify that many would not flock to the organization with the start of the Great Tribulation. “Any person who wants to survive into God’s righteous new order urgently needs to come into a right relationship with Jehovah and His earthly organization now. Notice in the following two articles the way a Witness is to deal with the question “Do Jehovah’s witnesses believe that only they will be saved?” Stating that only Jehovah’s Witnesses will be saved is to be avoided. It is recommended to say NO; even though the explanation given shows the answer is yes. After reading the whole paragraph, it is clear what is meant. There are 12 classical world religions and over 34,000 Christian sects . Most of these say that salvation requires following their particular God. The extremist sects say that belonging to their particular sect is a requirement for salvation. Many countries are predominantly just one classic religions, and many people have little choice in their religion, or even opportunity to learn of other beliefs. Even in countries with more diversity, and opportunity to change religions, indoctrination since childhood means it is difficult for people to consider other points of view. If you have been raised from birth as a Jehovah’s Witness, imagine if the Watchtower Society is not the true religion. Do you think it fair God is going to destroy you for being born into the wrong religion? As the Watchtower discourages active examination of other beliefs, is it fair you will miss out on everlasting life for not finding the correct one? Is the Witness that grows up in America listening to immoral ‘pop’ music more righteous than the Baptist missionary in Indonesia? Should the Nepalese monk, isolated from the world and Bible be destroyed for living the life of abstinence that he truly believed and was indoctrinated to understand was the way to achieve oneness with God? When a religion teaches absolute truth, it makes sense anyone not believing this truth is worshipping falsehood. Anyone not worshipping Jehovah is worshipping Satan, and so deserves destruction. If truth is easy to understand and God attracts his sheep, there is no excuse not to follow it. The flaw in this reasoning is that no Organization teaches absolute truth. Jehovah’s Witnesses certainly do not teach it. In its short 130 year history the Watchtower Society has changed its teachings so substantially that they have no right to claim a unique ability to understand truth. It is illogical to state God gave Russell the many wrong teachings that the Watchtower later had to reject. In Bible times, God indicated whom he was using through powerful signs. He spoke directly to Abraham and provided powerful miracles through Moses. First century Christians witnessed God personally speaking in approval of his son and watched Jesus heal the sick and raise the dead. The apostles and other Christians continued to display such powerful works. Jehovah’s Witnesses have never produced a powerful sign of any kind to assist identify their Organization as approved today. The problem with saying salvation is dependant on belonging to a single, small organization is reality proves that the Watchtower is not accessible to a large portion of the world. Much of the world does not even have access to the Bible. Over half the world is not Christian, and by and large the chance of being a Jehovah’s Witnesses is dependant on living in a country that was conquered or converted by Christianity over the last 2,000 years. Being a Witness is predominantly contingent on where one is born and billions of people will never hear of the name Jehovah or Jesus. Living within the following countries – Bangladesh, Cambodia, China, India, Mali, Nepal, Niger, Pakistan, Thailand and Turkey are around 3 billion people, nearly half the global population. Yet the 2006 Watchtower Service Report showed that combined these have less than 40,000 Witnesses, not even 1 for every 70,000 people. These countries represent many religious (Muslim, Atheist, Buddhist and Hindu) and ethnic (African, Indian, Asian and European) backgrounds, showing that no particular group is genetically disposed to be “goat-like”. In Pakistan and Bangladesh virtually all will be destroyed, the ratio of Witnesses to ‘worldly people’ is less than 1:1,000,000. In 2006, there was not a single Witness in Afghanistan. 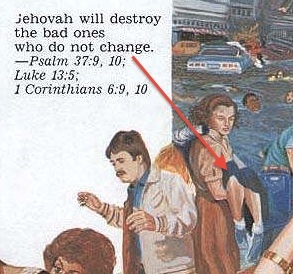 Is it fair for people who have never even heard of Jehovah to be destroyed at Armageddon? Even in Christian countries, it is illogical for God to destroy people for understanding the Bible in a manner that differs to that described by the Watchtower. A person reading the Bible without the aid of a Watchtower will never arrive at current Watchtower truth. At what point does it sound insane for a religion to say that only their followers deserve salvation? 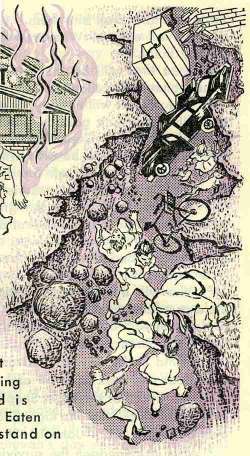 Does it sound crazy (or conceited) that the 11 followers of Mrs. Marian Keech’s flying UFO cult believed that aliens would destroy all but themselves? 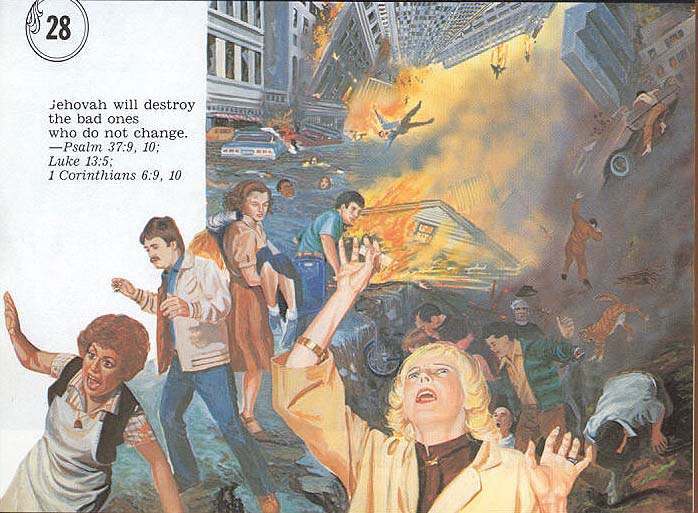 How about the Watchtower indicating that God will save 6 million people and destroy 6.5 million? Would it even be logical to believe that a religion with 1 billion members is the only acceptable one, if it means God would be required to destroy 5 billion people? To believe God would only find people of a single religion acceptable, regardless of size, does not seem fair. Only a small percentage of people convert to other religions and there is no single destination for converters. Their choice is the one they stumble upon at just the right moment in time, a matter of time and unforeseen circumstance. An ARIS survey shows that 84% of American adults retain the one religion for life. Of the 16% that leave, the largest group leave all religion. “Some groups such as Mormons and Jehovah’s Witnesses appear to attract a large number of converts (in-switchers), but also nearly as large a number of apostates (out-switchers).” The 1,200,000,000 hours of preaching by Jehovah’s Witnesses in 2004 resulted in only 200,000 baptisms, of which half were likely teenagers raised within that religion. Changing a person from the religion of their upbringing is no easy task. On September 11th 2001, people watched in horror as the twin towers in New York collapsed, killing several thousand people over a disagreement of religious ideologies. Yet this is inconsequential when compared to the destruction Jehovah is expected to mete upon humankind, billions of which have never seen a Bible. If the senseless death of a few thousand people offends a person’s sense of justice, how much more so should the global slaughter described by the Watchtower Society and eagerly awaited by Jehovah’s Witnesses? Paradoxically, Armageddon will result in the eternal destruction of billions of evildoers that do not worship Jehovah, yet lead to the resurrection of billons of evildoers that did not worship Jehovah. The majority of both groups have never even heard of Jehovah, so what exactly is the difference between the two, what makes one group less deserving of life than the other? There is no overwhelming difference, other than an organization’s attempt to grow its own membership. With illogical conceit, members of many religions believe they alone belong to the only true faith. Do these members believe that, endowed with luck they stumbled upon – or were born into – the Truth? Do they possess a more intelligent or perceptive mind? Is their heart condition so superior to all others that God and his angels directed them to the only true religion? The root of such reasoning lies with the pride of religious leaders that prey on the gullibility of naïve followers; followers who are content to accept that there are many routes to salvation if so told, but just as willing to believe that they alone deserve salvation. David B. Barrett, et al., “World Christian Encyclopedia : A Comparative Survey of Churches and Religions in the Modern World,” Oxford University Press, (2001). Barrett lists 19 major world religions, subdivided into 270 large religious groups. He has currently identified 34,000 separate groups amongst Christianity alone. He notes what he terms as “distinct religions” have risen from 1,000 in 1900 to 10,500 today, with the likelihood to increase to 15,000 in a quarter-century. First of all I want you to know that what I’m going to tell you is out of love. Have you ever stop to think why there are thousands of reiglions? The answer is because not everyone is humble enough to be taught by another person. People are so arrogant that they think they can understand an interpret the Bible by themselves, which is exactly what Satan wants everybody to do. Have you ever stopped to think that Jehovah is a God of organization? In heaven the angels are organized in an orderly fashion, there is an Archangel, Seraphs, Cherubs, and messenger angels. If God has a heavenly Organization that means he has an earthly one too. In the time of Noah, if the people wanted to get saved from drowning they had to come to Noah and get inside the boat, Jehovah guided him to built. In the time of Moses, if people wanted to have God’s approval they had to listen to Moses instructions, the Bible says that even foreign people joined Moses,.or a mixed crowd. In the time of the Apostles there were other reiglions like the Scribes, Pharisees, and Saduccees. But God used the Apostles to spread the truth of the Bible. I am going to give you two examples., you can read them. Acts 8:26-40 and Acts 18: 18 , 24-26 The Bible clearly teaches that he has an earthly Christian Organization that he uses to get the truth to all the people around the world. Mathew 24:14 Only an organized group of true Christians can accomplish that mission with the help of the Holy Spirit. Also the scriptures says that God has taken a people from all the nations to take his name earth wide Acts 15:14. And as we all know the name of God is Jehovah. Psalms 83;18 Rev 19: 1,3,4,6. I’m going to tell you what’s going to happen if you study by yourself, forcefully you’re going to end believing like the Catholics, Pentecostals, Baptists or all the reiglions that belief in the Trinity, Hell, Immortality of the soul, going to war, participating in Politics,taking part in Pagan celebrations, not going door to door and not preaching the good news of the Kingdom. It seems to me that the reason you don’t want to continue studying with J.W.’s is because even before you started studying you already had your mind set in believing contrary to what we believe. Don’t make the worst and last mistake of your life. Oh my, what you say is so misguided. You really need to do some research. Start with http://www.jwfacts.com/watchtower/organization.php The Watchtower is not guided by God, it is a worldly corporation run by opinionated men that cannot even get their doctrine straight. The doctrine change as the Governing Body change because they teach the opinions of men. It is ironic that think reading the Bible alone will make you believe standard Christian doctrine. That indicates that Christianity is teaching the truth. If your comment is directed at me, I used to be in Bethel, know a member of the Governing Body personally and my father was a CO, so I know the doctrine, and through my site have made it very easy to understand why it is false.